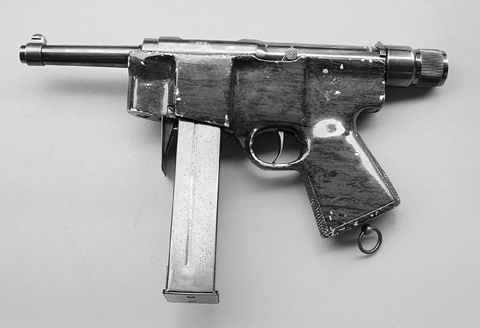 The Hafdasa C-2 is a submachine gun of Argentine origin intended for crews of armored vehicles and is chambered in 9 mm Luger and .45 ACP calibres. It has an aluminium lower receiver and is fed from a wide 50 round box magazine for 9x19mm rounds and 40 round magaine for the .45 ACP rounds. Its magazine insert has a dust cover that folds open forward to form a grip shrouding the front of the magazines. The C-2 was available with a folding metal stock and predates and even outs the likes of many modern machine pistols.